Preheat oven to 400°F. In bowl, combine egg whites and whisk until bubbly. 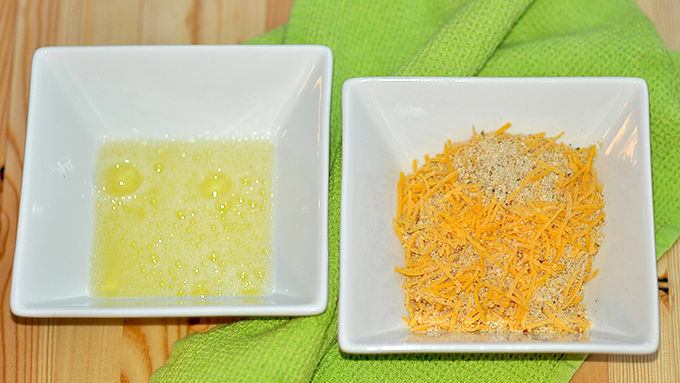 In another bowl, combine bread crumbs and cheese. Remove chicken from oven and place on platter. Top with fresh parsley and serve with sauce on the side for dipping. Enjoy! 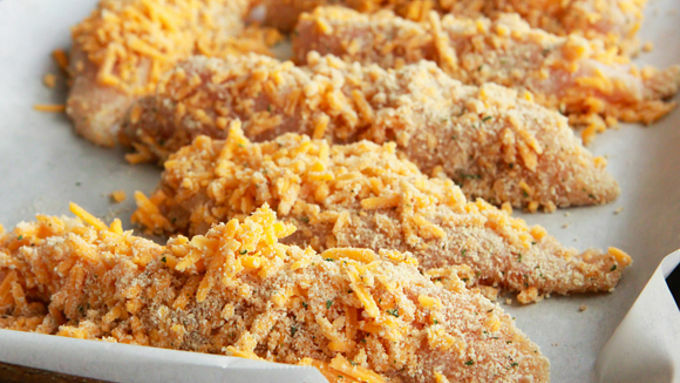 Cheddar is better… especially with this cheesy baked chicken recipe! 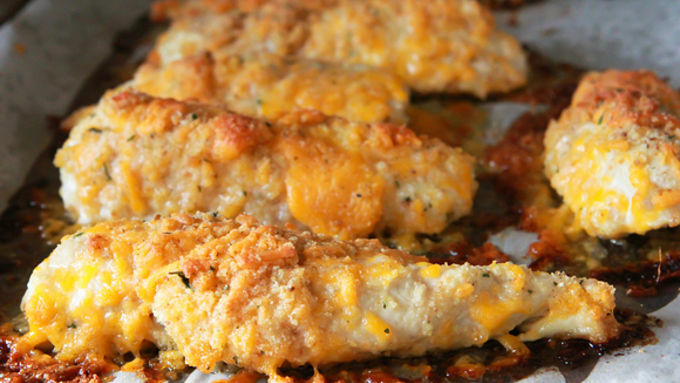 We already know cheese makes everythang better, but hunkloads of cheddar on chicken? Yes puh-lease. 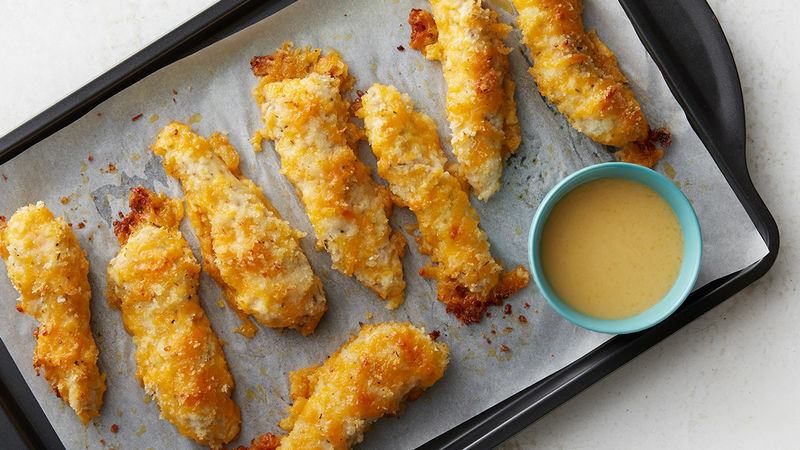 We'll take a whole batch of this Crispy Cheddar Chicken! Pull together a few basic ingredients, most of which you probably already have in your pantry and fridge. Booyeah, baby! It's a pantry meal extraordinaire! Slicing the chicken breasts into three pieces will help your recipe cook more quickly, and make it easy to serve up the perfect serving sizes for tots and adults sitting at your dinner table tonight. While the chicken bakes, start your creamy cheese sauce, then cover it and set it aside until serving time. Feel free to add more broth to thin the sauce to your desired drizzling consistency. Give it a quick stir before you plate up your chicken. 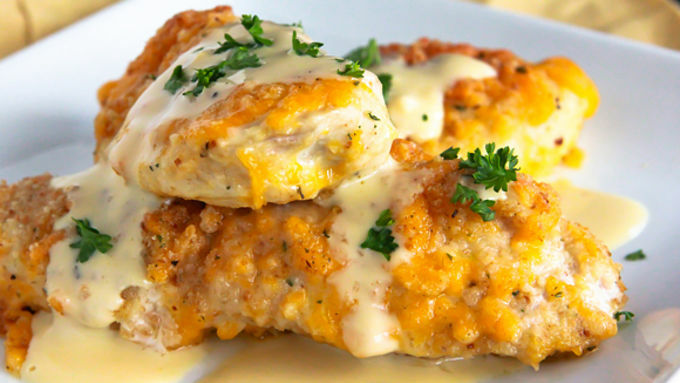 Top chicken with cheese sauce. Grab fork. Feed mouth. Grunt with cheddar pleasure. Say Cheese! Say Chicken! Chicken and cheese -- alliteration and food pairing at its best. For a few more recipes that make chicken and cheese a creative combo, check out our cheesiest chicken recipes here.